Come see this astounding 4 bedroom, 3 bath home that has been lavishly upgraded. You’re immediately greeted with the feeling of spaciousness as you enter the open concept design with extended height ceilings. 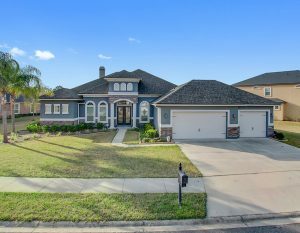 This home has been masterfully layout with a 3 way split floor plan offering plenty of privacy for even the largest of families. Features include: Gourmet Kitchen with quartz countertops, soft-close cabinets, large island overlooking livingroom, hardwood flooring throughout common areas, built-in bookshelves, coffered ceilings, guest-suite with private bath, massive bonus room, extended patio overlooking a serene water view, large master suite complete with a oversized walk-in closet, garden tub and double shower. Welcome to your New Home! This gorgeous Cordova model was built in 2014 and has been used solely as a vacation home. Some of the appliances have never been used! As soon as you walk in, you will notice the soaring ceilings, natural lighting, spacious kitchen with luxurious granite counters and fantastic views of the lake and golf course. This home features 3 beds, 3 baths, office and the game room w/a closet and could be used as a 4th bedroom. The Master Bedroom and resort feel bathroom will leave you in awe. Huge his and her closets and private entrance onto the patio to enjoy the sunrise and your morning coffee. Don’t delay as this home won’t last long! 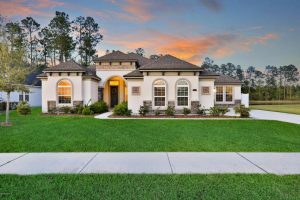 This is one of the only Cordova models in Eagle Landing and includes a spacious Estate Sized Lot. 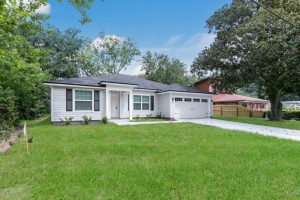 Brand New Construction with no HOA dues located on a culdesac street-so No pass-through traffic. Nice, open 4 bedroom floorplan with durable vinyl plank flooring throughout. Fridge and stove will be added prior to closing. Hardie board siding on the exterior and the home includes a 2-10 Builder Warranty! (Seller will add a privacy fence at list price) Ask about available down payment assistance programs. Best of the best!! 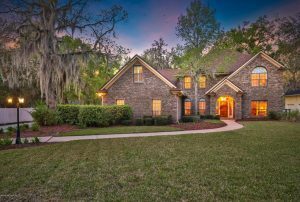 come see this marvelous brick front home located in sweetwater creek community. This home features 4 bedrooms 2 full bathrooms, separate formal living and dining room, large family room, kitchen open to family room, screened patio overlooking a large backyard. 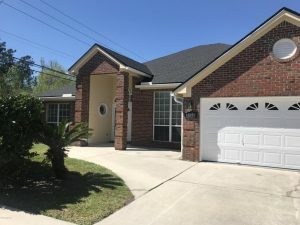 Mostly everything is brand new starting with new roof and rain gutters, fresh paint inside and outside, new water heater, new porcelain and laminate floors, new baseboard, new ss appliances, new kitchen cabinets, granite and sink. New backsplash. New fireplace stone. All window shutters are new, ceiling fans are also new. Both bathrooms are brand new including floors, mirrors, showers, toilets, vanity and granite sink. The master bedroom has shower and jacuzzi. This house will not last. Sat (04-13-19) 11a to 2p. Let’s make your Dream of owning WATERFRONT a reality. 1798 Lakedge Dr, 32068, 1 mile West of Whitey’s Fish Camp/Restaurant. Navigable to the St Johns River & Atlantic Ocean. MLS 985065. Awesome views of the Lake from most rooms. Chef’s Delight Kitchen features Double Oven (1 is Convection) Jenn Air Downdraft Cooktop in Island, Granite Counter Tops, Cabinets Galore & Walk-in Pantry. Dramatic Brick Fireplace to take the chill off. Vaulted Ceiling, Moulding detail provides Elegance. Two Stairways for Convenient Access to Upstairs. Double French Doors to Patio from Family Rm & Breakfast Area. Emergency Generator uses Propane Gas. Two HVAC units keep you Comfortable year round. 2.24 acres.